My parents took up residence with us in 1972 by living in an in-law suite. Five years later my mother died. Within weeks we realized how much she covered my father’s cognitive decline. Within a couple of years the dementia became Alzheimer’s. My children lived their childhood during those years. There was little public or private assistance available and knowledge of the disease was sparse. I could only wish for such a book back then. In 1984-85, I completed a sabbatical at the University of Georgia completing a Graduate Certificate in Gerontology as a result of our journey through Alzheimer’s. 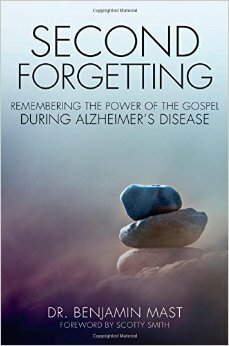 It is within this context that I offer this review of Second Forgetting: Remembering the Power of the Gospel During Alzheimer’s Disease by Dr. Benjamin Mast. This book is bigger than Alzheimer’s. It is about forgetting God’s promises when under pressure—hence the title, Second Forgetting. Mast uses the cyclical lifestyle of Israel as his illustrative framework for his discussion of the Christian’s response to Alzheimer’s. In chapters two and three, the author provides an excellent current summary of our knowledge of the disease and memory function. He completes this discussion with very practical instruction regarding how caregivers can best interact with one suffering from the disease. One of the greatest fears when contemplating the possibility of becoming the victim of Alzheimer’s is the loss of identity. Who am I? Who will I be? Where is hope? These questions lead Mast into a marvelous discussion of the gospel and our assurance rooted in Romans 8:35-39 supported by a host of other passages. He makes application to both the patient and the caregiver. Chapters five and six focus upon caregiving and the caregiver. Having walked the journey for seven years, I could identify with about everything he wrote and could provide dozens of illustrations. The only element that I would add to his marvelous discussion is the need to have a sense of humor (as my wife says a sense of the ridiculous). Mast did note that caregivers are not the Savior. That is, they need not take themselves so seriously that they must be on top of it all the time. The next chapter is a very practical discussion of the role of the church in Alzheimer’s care. While Mast touches the bases so to speak, this subject deserves a more robust treatment. His bases could be the chapter headings for a well developed book on the subject, The Role of the Church in Alzheimer’s: Ministering to the Victim and the Caregivers. It seemed to me that chapter ten would have been better placed as chapter eight and then his chapters eight, nine, and eleven would provide a unit on spiritual development in the journey through Alzheimer’s. His chapter ten is vital. It should be lifted out and put into a pamphlet titled: Prevention of and Planning for Alzheimer’s Disease. Everyone needs to read it and heed it early in life. This is a valuable book for everyone! This is a handbook for pastors! This is a useful book for biblical counselors! Get it and read it! Is it okay to buy this book for someone else?